Were UN Plans to Ban Nukes Pre-empted by Trump? Despite not being a signatory to the nuclear non-proliferation treaty, the United States exerts a strong influence over the United Nations plans to negotiate a ban on nuclear weapons than any other nation. US President Donald Trump pre-empted their agreement by proposing to expand the United States nuclear arsenal. As the U.S. Congress prepares to vote next month on the landmark Joint Comprehensive Plan of Action (JCPOA), which was agreed on July 14 between the world’s leading powers and Iran, and has been approved by the U.N. Security Council, eminent nuclear non-proliferation experts are mobilising international support for its immediate implementation. The recent agreement between Iran and six nations on nuclear non-proliferation will likely have a “positive impact” on North Korea, according to a senior South Korean diplomat. The nuclear agreement concluded last week between Iran and six big powers, the United States, Britain, France, Russia, China and Germany, is threatening to trigger a new Middle East military build-up – not with nuclear weapons but with conventional arms, including fighter planes, combat helicopters, warships, missiles, battle tanks and heavy artillery. As the Iranian nuclear talks hurtle towards a Mar. 24 deadline, there is renewed debate among activists about the blatant Western double standards underlying the politically-heated issue, and more importantly, the resurrection of a longstanding proposal for a Middle East free from weapons of mass destruction (WMD). While it’s anyone’s guess whether a final deal will be reached over Iran’s nuclear programme this year, a number of key international actors have forcefully weighed in on calls from within the U.S. congress to impose more sanctions on the Islamic Republic. Buoyed by the failure of the U.S. and five other powers to reach a comprehensive agreement with Iran over its nuclear programme after a week of intensive talks, pro-Israel and Republican hawks are calling for Washington to ramp up economic pressure on Tehran even while talks continue, and to give Congress a veto on any final accord. In the United States, the negotiations aimed at a final deal between world powers and Iran over its nuclear programme—in a crucial phase this week—are far from the minds of average people. But for many Iranians, the talks hold the promise of a better future. 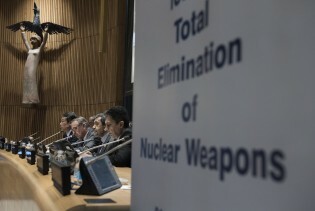 Nov. 24 is the deadline for six world powers and Iran to reach a final deal over its nuclear programme. If there is no deal, then the talks are likely to be extended, not abandoned. The head of Iran’s Atomic Energy Organisation, Ali Akbar Salehi, says the International Atomic Energy Agency (IAEA) should now close its investigation of the issue of Iran’s development of high explosives detonators the IAEA has said may have been part of a covert nuclear weapons programme.